But you might also know that I have been through 2 phases of vegan keto in the past year, and it was during the first of these phases that I first stumbled across bean & lentil pastas. 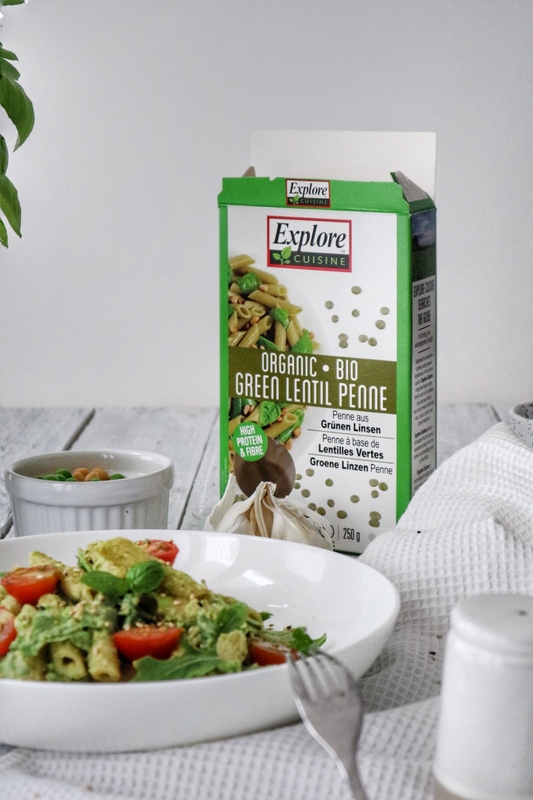 This pasta is vegan, packed with protein and fibre and low in carbohydrates, which makes it perfect for a low-carb (or keto diet)! Oh and did I mention that it’s gluten-free also? 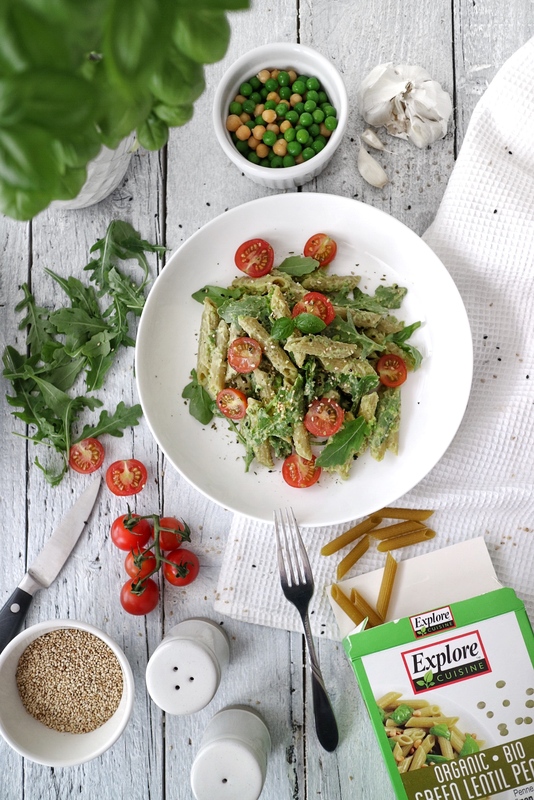 I have been a loyal buyer of Explore Cuisine since coming across their Edamame Bean Pasta and I am absolutely thrilled to be working with them on their #UseYourNoodle campaign. 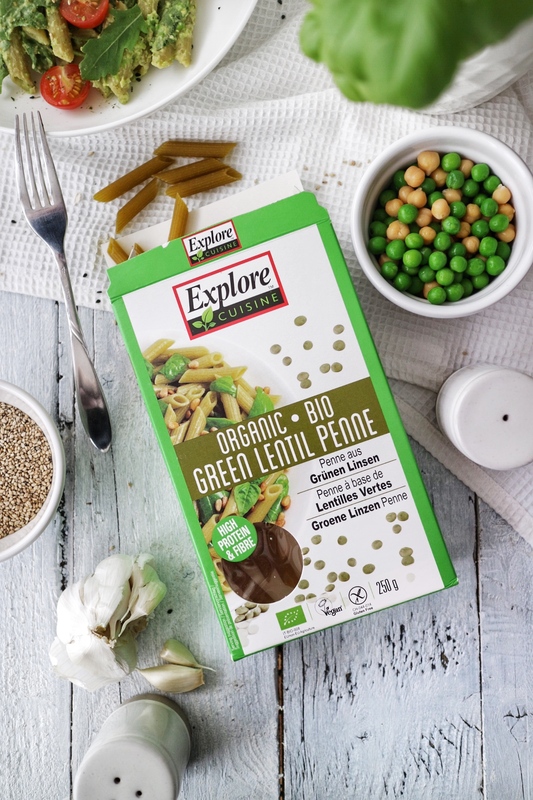 Explore Cuisine’s range includes everything from Edamame Pasta to Black Bean and Lentil Pastas – and also in all shapes from Spaghetti to Penne! As I have so far been sticking to their Edamame pasta (simply for the high protein/low carb content!) 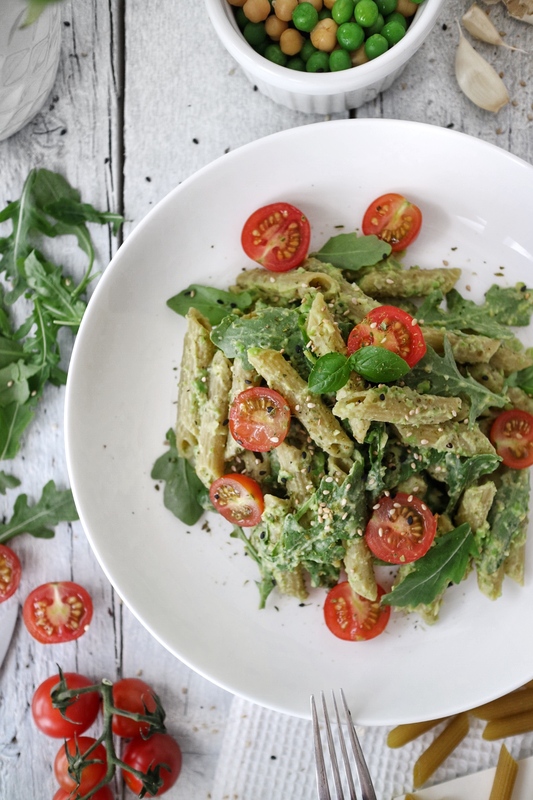 I am excited to try the rest of their range, such as the Green Lentil Penne that I used in this recipe. 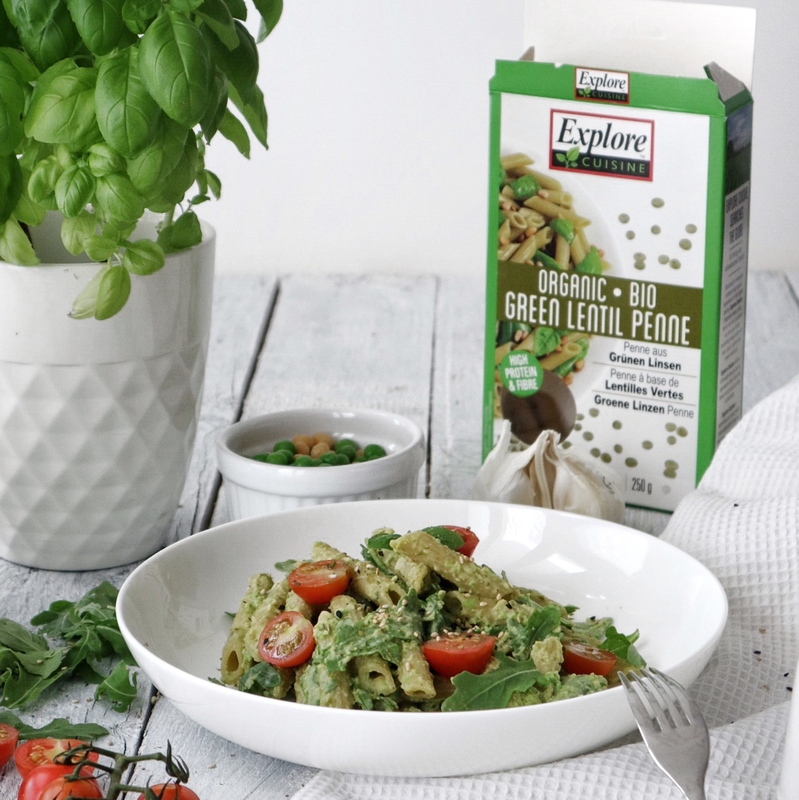 With 21.2g of protein per 100g the Green Lentil Pasta is high in protein – in case you did not know: A product classes as ‘High in Protein’ when more than 20% of its calories come from protein. It also only takes 7-9 minutes to cook, which makes it a quicker meal than regular penne, which normally take around 10-13 minutes to be ready. 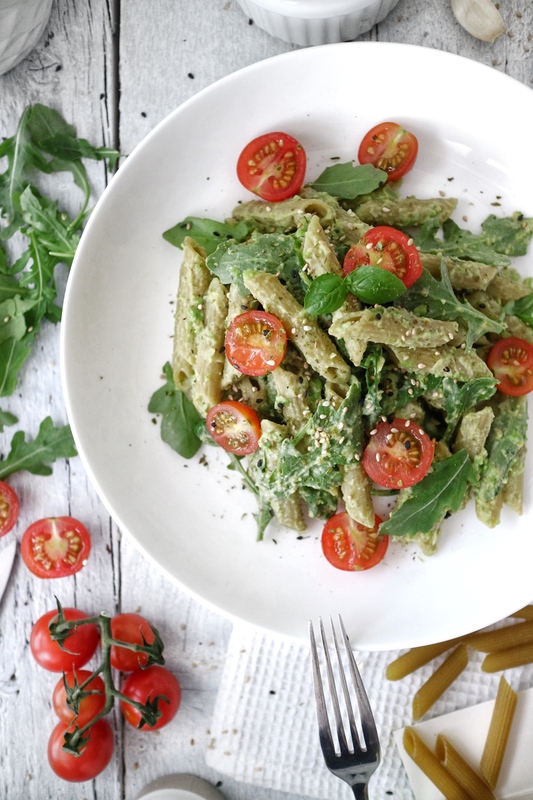 This Lentil Penne with Pea Pesto & Cherry Tomatoes can be enjoyed both warm & cold, which means that it’s not only great to be shared with friends & family (I actually shared this with my friend Christian, who came around for lunch!) but also makes it the perfect lunchbox filler! It only takes about 10 minutes to prepare and makes the meal prep super quick and easy. 1. Bring about 1 litre of lightly salted water to the boil in a medium saucepan, then add the Green Lentil Penne and reduce to a medium heat. 2. 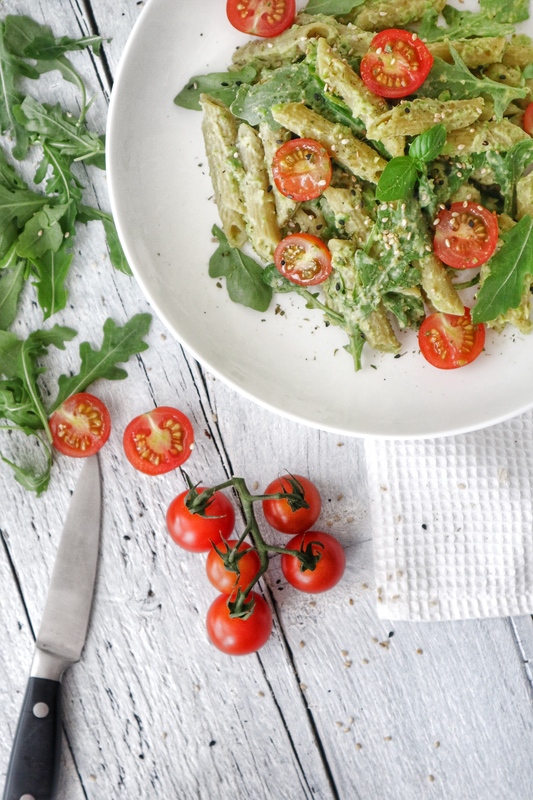 Whilst the penne is cooking, prepare your pea pesto by adding the peas, chickpeas, garlic, salt and onion powder to a blender. I’ve used frozen peas in this case, that I defrosted upfront in lukewarm water. Blitz the ingredients until roughly combined, then add the flaxseed oil, lemon juice and about 3 Tbsp of pasta water to the blender. 3. 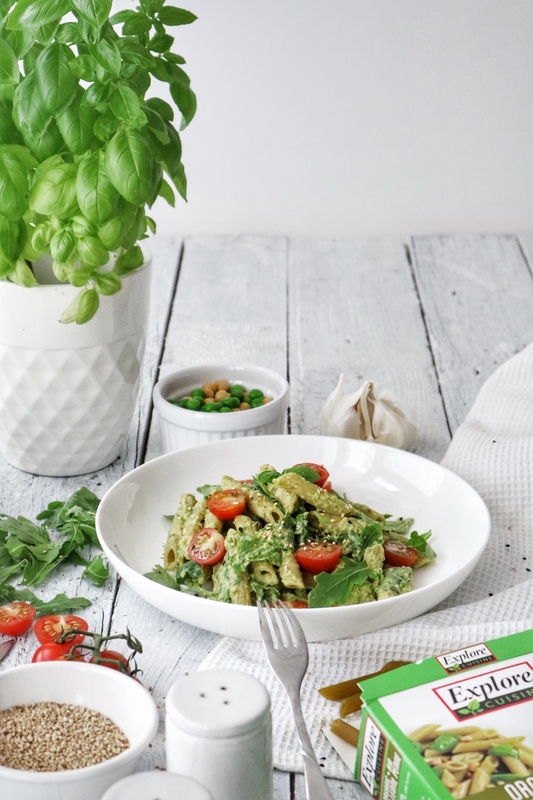 Blend until the pesto is smooth – you might have to use a spatula to scrape down the sides of your blender in between, so all peas and chickpeas are mixed up properly in the pesto. I like my pesto smooth, but of course if you don’t mind it a little chunky, then feel free to only roughly blend it all together. 4. Drain the pasta once the cooking time elapses & shortly run cold water through the colander to stop the cooking process of your penne. 5. Return the penne to the empty saucepan, then add the rocket salad & pesto and thoroughly combine. 6. Plate the pasta dish & then top with cherry tomatoes & sesame seeds. 7. The most important step: Enjoy! This blog post contains a paid collaboration with Explore Cuisine. You can find out more about the brand and their products on the Explore Cuisine Website.